If your constituent would like to receive a consolidated receipt, it is important to set the receipt type to “Consolidated” when creating a new gift. Similar to when the “Receipt Later” box is selected, a receipt will not be created for a consolidated receipt gift, even if that box is not checked. However, setting the receipt type is important for later identifying which payments to add to your consolidated receipts. After setting the receipt type to consolidated, you can process the gift as usual. When the transaction is created, no receipt will be associated with the transaction. A consolidated receipt can be created for a constituent at any time if they have at least one approved payment with a consolidated receipt type. However, it is most common to send consolidated receipts at a set time in the year, and collect all of the payments from the past year into one document. 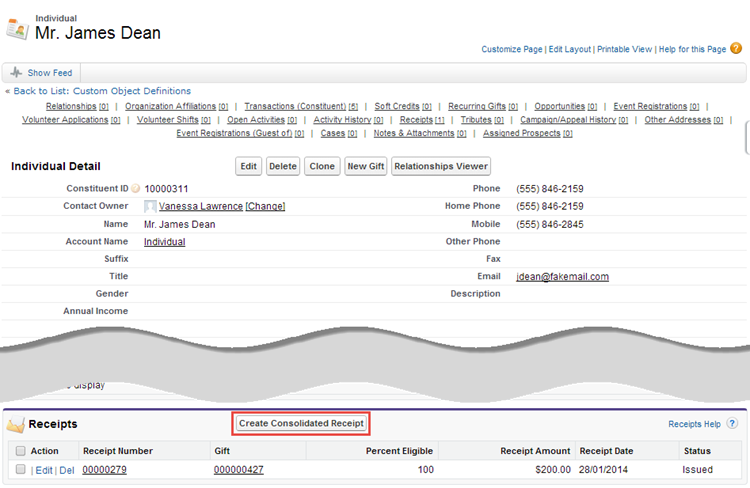 When you are ready to create a consolidated receipt, locate the Receipts related list on the individual’s detail page. Click the “Create Consolidated Receipt” button to open the consolidated receipt interface. Note: if the button is not visible, you may need to add it to the page layout. The consolidated receipt interface lists the constituent’s payments which haven’t been receipted. Using the “Payment Filter”, you can choose to display un-receipted payments from the current calendar year, the previous calendar year, or all un-receipted payments for the constituent. 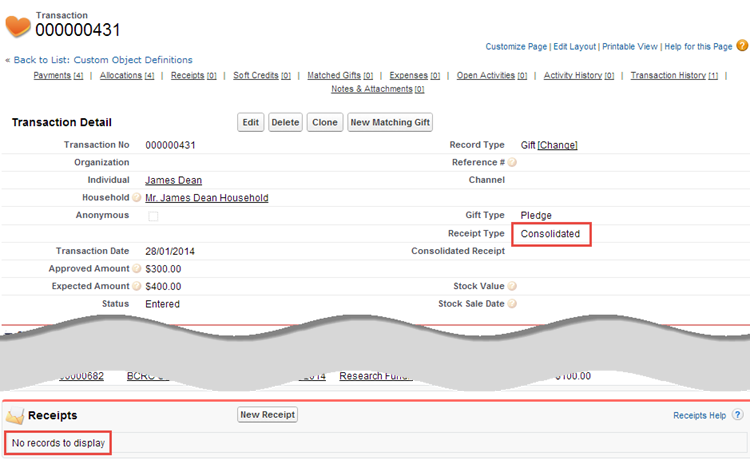 From the filtered list, select the payments you would like to include in the consolidated receipt. 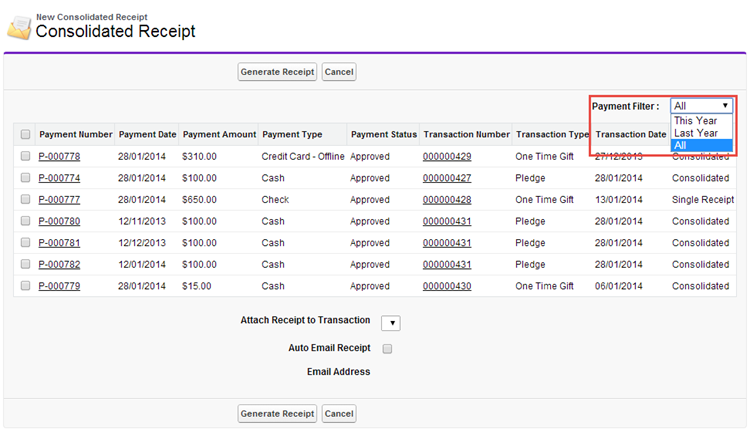 To select all of the listed payments, click on the box at the very top of the list, in the table headings row. Remember that payments from Single Receipt transactions will show up on the interface if they haven’t been receipted yet - that is, if the “Receipt Later” box was selected for the transaction. Make sure to only select payments with the “Consolidated” receipt type. The consolidated receipt can contain payments from multiple different transactions, but the receipt record must be located on a single transaction. 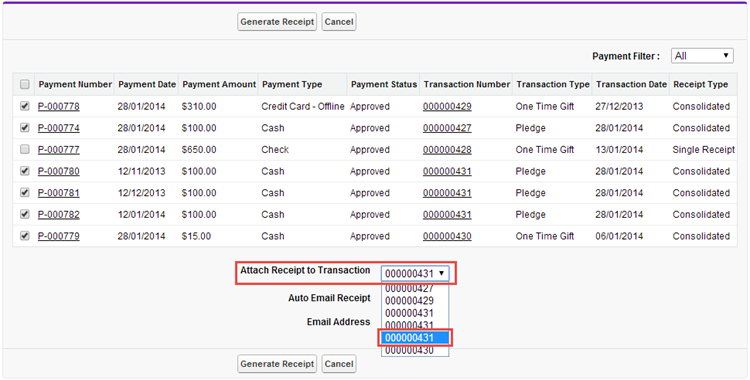 Using the drop down menu, select a transaction you would like to attach the receipt to. In order to make the receipt easier to relocate, it may help to consistently choose the largest or smallest transaction number associated with the consolidated receipt. 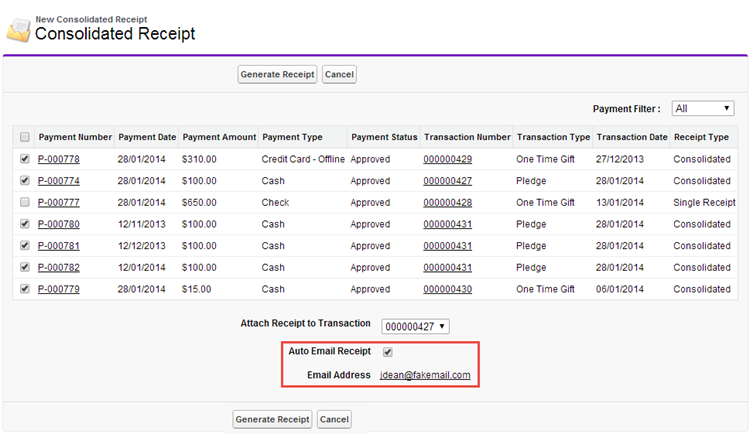 If you would like to automatically issue the consolidated receipt over email, check the “Auto Email Receipt” box. The individual’s email will display below, and a receipt based on the consolidated receipt template will be mailed by Causeview to that email. If you plan to manually issue the receipt at a later time, leave the box blank. Click on “Generate Receipt” to create the receipt and, if selected, automatically issue the email receipt. Causeview will display the completed consolidated receipt. The “Gift” named on the receipt is the transaction the receipt is attached to. The receipt type should always be consolidated, and if the receipt status is “To be Issued”, Causeview will use the consolidated receipt template. Receipts can be issued or reissued using the “Print Receipt” button, as usual. Note that the transaction total and amount receipted will not necessarily match, as the transaction total is derived from the gift the receipt is attached to, while the amount receipted is the sum total of all payments associated with the receipt. Notice in the payments related list that multiple payments and transactions are associated with this consolidated receipt. 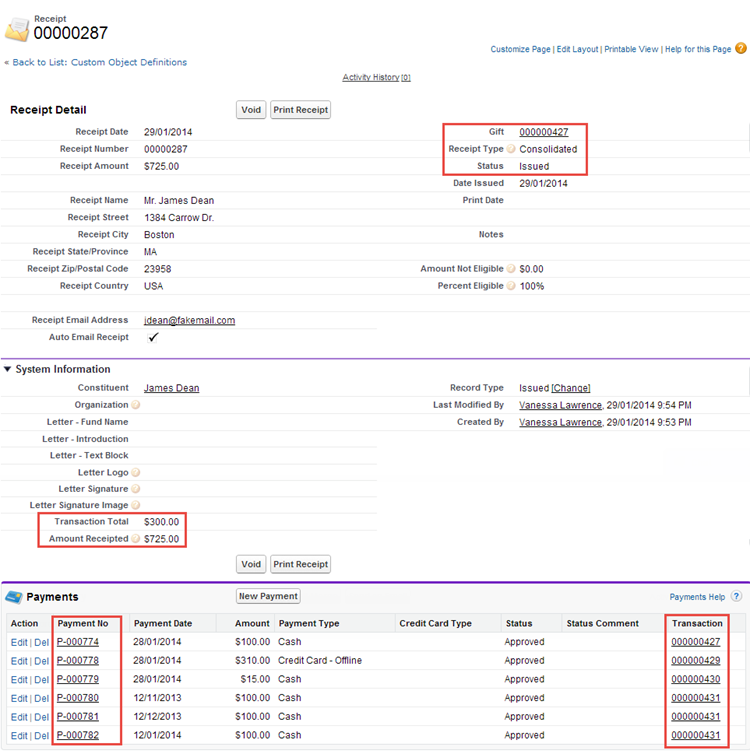 While the receipt is only visible in a related list for the transaction it is attached to, the receipt is associated with all of the listed payments.